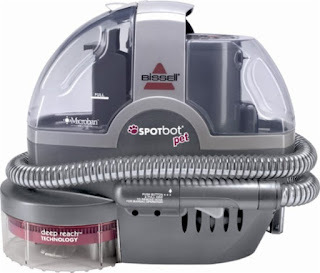 Today ONLY - this BISSELL - SpotBot Pet Portable Deep Cleaner $99.99 (Retail $149.99). Bissell SpotBot Pet 33N8 Portable Deep Cleaner: Remove tough stains and pet odors at the push of a button with this hands-free portable deep cleaner. Uniquely designed brushes reach further into the carpet where the deepest part of the stain resides for complete spot removal — no elbow grease needed. Take a product tour.